Travel Packing Tips for a Spring City Break. I’m heading on a few city breaks this Spring and whilst I’m generally quite organised on the packing front, when it comes to city breaks I’m learning to lean toward the less is more approach. In an effort to try and banish the trauma of lugging an oversized suitcase through an airport or train station whilst simultaneously attempting to figure out where to go and (on family city breaks) corral 3 kids into line, my new approach to packing for a short break has been forged from a few careful pre-styling tricks and a little thoughtful capsule packing. So here are my travel packing tips for a Spring city break so that you too can find that travelling light can become a joy. First up there’s the style edit to consider. I tend to lay the clothes I’m thinking about taking on a bed or floor space a few days before I’m set to go. From there I figure out the number of days and evenings I’m away for and start to think about an outfit for each day along with what you will need for an evening out. Scope out which pieces work together and which can overlap and bring you double-whammy wearability. 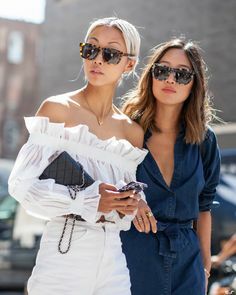 For example, can you sub a pretty blouse and heels as evening wear with that slogan knit and sneakers you wore during the day, yet keep the rest of the outfit the same for your day to night transition? I find that packing with ‘outfits’ in mind hones the process and avoids you going off into left field and chucking in 3 spare kilos of clothes you probably won’t get around to wearing. Mansur Gavriel tote, Boden sunnies, Mulberry iPad case (old), J.Crew tee (similar here) & denim jacket, Bally loafers, Tohum bracelet. 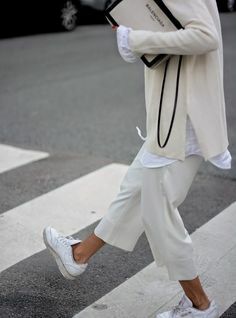 Whilst you are doing this outfit edit another great idea is to stick to a colour palette. I’m a big fan of white and blue for summer (catch a previous blog on the bliss of nailing your vacation colour scheme here), but for the rest of the year you’re more likely to catch me working denim, neutrals, navy and a pop of colour like red or yellow with a few animal print accessories chucked in for good measure. The fab thing about deciding on a colour palette is that your outfit choices work seamlessly together and you can switch around separates depending on your mood on the day or the weather. Lands’ End rain mac (gifted), Club Monaco striped tee, J.Brand Selena jeans, Kurt Geiger sneakers. Talking of weather, make sure you include a weather appropriate jacket or coat. Check the forecast for your destination a few days before you head off and consider which layers you can use from your edit to cover any unexpected changes. I often take a trench or a parka and then pack a blazer or denim jacket for doubling up on colder days and segueing through to the evening. When you are ready to pack, pop the heavier items like shoes and other bags into the base of your travel bag. I like to keep my shoes in dust bags so they don’t make anything else dirty either on the way or way home from a trip. Then start rolling your clothing items and neatly fitting them in alongside the heavier items. I know Marie Kondo is all about her signature fold, but I’m still a fan of a neatly rolled shirt or tee for taking up minimal space. For cosmetics and wash bag items, I have some go-to travel-sized beauty items which are ready packed in a small pouch and easy to grab and include in my case, but these days I often trust that wherever I’m staying will at least have shampoo/conditioner and soap, so I leave those bulky items at home. Whilst we’re on the subject of small items – I pack all my lingerie in a small laundry/lingerie bag and also carry a spare laundry bag to ensure all my dirty stuff ends up in one place and is ready to chuck in the wash as soon as I get home. When I was trekking I became a packing cube convert… separate zip bags in all shapes and sizes which help you segregate your packing. I think these work well for longer trips and if you are heading to a bunch of different climates in one trip, but for a short city break they may well take up more room than you have available. For a short break I use an Away suitcase which has much the same concept as packing cubes. It’s chock full of lots of compartments which allow you to segregate and arrange your items accordingly as well as some packing cubes which you can buy as an added extra. It also has a nifty charger which sits just underneath the handle and is genius for charging on the go. 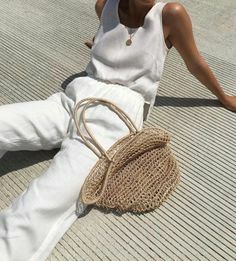 So in terms of what’s out there to help you in master the art of packing, here’s a quick edit of practical and luxe items which we love and certainly make the whole process a little more organised if not downright stylish. Click the images to shop. #AffiliateLinks used.